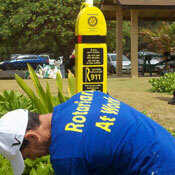 The Rotary Club of Kauai is involved in many local community projects. Each year the Rotary Club of Kauai holds Kauai’s Premier 5K, 10K, and Half Marathon Runs, plus a 5K non competitive Walk. The Run is normally the second Saturday in November and is held at the Anne Knudsen Park in Koloa. All of the funds raised are given as scholarships to Kauai’s youth for the University of Hawaii at the Kauai Community College, the Rotary Youth Leadership Award (RYLA), and other community projects. This event is presented by Wilcox Health with the support of Du Pont Pioneer, Safeway, The County of Kaua’i, and other generous sponsors. Mahalo Nui! Each year the Rotary Club of Kauai puts on Lihue’s Annual Christmas Extravaganza, the Lights on Rice Parade. The parade is held on the first Friday in December. The Parade Route is on Rice Street from Kalena Street to the County Building in Lihue. Click here to go to the Lights on Rice Parade website. Each year the Rotary Club of Kauai does a local service project that earns $10,000 from the Weinberg Foundation to be given to any local charity that benefits the poor and needy. One year we did a cleanup of Lydgate Park and presented the $10,000 Weinberg grant to the the Kaua‘i Police Activities League. And recently we helped clean up Niumalu Beach Park in Nawiliwili and presented $10,000 to the Boys and Girls Club of Hawaii, Lihue Branch. Started by the Rotary Club of Hanalei Bay, we help promote ocean safety by installing and maintaining rescue tubes on sections of beaches that do not have manned life guard stations.